Heat a non-stick wok over high heat. Add a drizzle of oil, spring onions and ginger and cook whilst continually stirring for 2 minutes. Add pork mince and cook whilst continuing to stir (breaking up mince as you go) for 8 minutes or until the pork is cooked. Add the hoisin sauce, tamari, sesame oil and water chestnuts - stir and cook for 2 minutes. 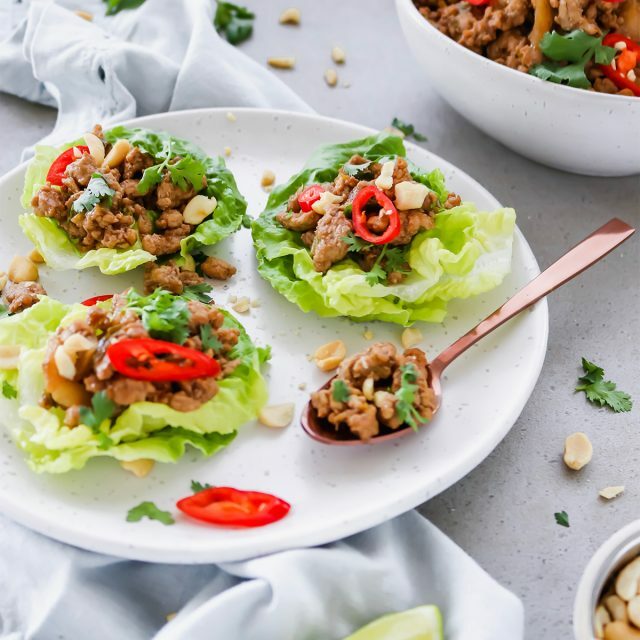 To serve, evenly divide the pork mince amongst the lettuce cups, top with fresh coriander leaves, finely sliced chilli (optional), lime wedges and chopped peanuts.